Variety of Niche French Perfumes 7 Samples Annick GOUTAL, Serge LUTENS NEW!!! Annick GOUTALTENUE DE SOIRÉE 1.5ml. Annick GOUTALPETITE CHÉRIE 1.5ml. Annick GOUTALROSE POMPON 1.5ml. Annick GOUTALÉTOILE D'UNE NUIT 1.5ml. BY ARD AL ZAAFARAN. Oud 24 Hours Gift Set Includes: Oud 24 Hours EDP 100ml Oud 24 Hours EDP 20ml Oud 24 Hours Powder 100gm Oud 24 Hours Body Lotion 100ml Oud 24 Hours Soap 100gm Oud 24 Hours Shower Gel 100ml. Fragrance Notes: Floral, Animalic, Leather Notes, Earthy Notes, Amber, Musk. Golden Needle Tea. Midnight Black Tea. Oolong Tea. Calvin Klein CK One Gift Set 100ml EDT 20ml EDT. The differences are the amount or the concentration of oils that are in the scents. The higher the concentration of oils, the longer your scent will last, and the less you should need to apply. Shams al Emarat Khususi Collection / Giftset by Ard al Zaafaran. in the top note convert rapidly to oriental spices, woody notes and cedar. An impressive, sensual and masculine fragrance whereas an amazing combination of citrus and oriental–woody notes that inspires! Bvlgari The Iconic Miniature Perfume Collection Gift Set, Unisex Fragrance, NEW. D&G The Collection Edt 5 X 20ml 1 Le Bateleur 3 Limperatrice 6. 10 grams Mabsoos. 24 grams bakhoor incense. 6 ml concentraed fragrance oil. 1 ml sample fragrance oil. White Musk. Fragrance Notes. Floral Notes. Gift box Fior di Loto by Tesori D'oriente. Content inspired by the high-quality Tesori d ' Oriente Fior di Loto products with the irresistibly sensuous and warm scent of the Lotus Flower. Tesori d ' Oriente shower cream Fior di Loto 250 ml. Sospiro 15ml Gift Set 5 Bottle - 5 Aroma - 5 Senzation New Box. Condition is New. Dispatched with Royal Mail 2nd Class. Top note is lemon; middle notes are rose and saffron; base notes are teak wood, agarwood (oud), vetiver, white musk and amber. Size: 20ml. Fragrance Family: Oriental. BY DAQAAT QALBI PERFECT SET FOR HIS & HER. By Daqaat Qalbi. Daqaat Qalbi SHOWER GEL - 150ml. Daqaat Qalbi EAU DE TOILETTE - 100ml. 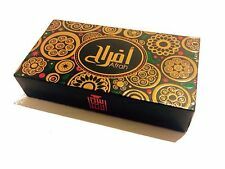 Daqaat Qalbi EAU DE TOILETTE - 15ml. Daqaat Qalbi BODY LOTION - 150ml. 1 x TESORI d' ORIENTE Fior di Loto shower cream 250 ml 1 x TESORI d' ORIENTE Fior di Loto body lotion 300 ml jar. Indulge yourself with this aromatic toiletries by Tesori d' Oriente! This extensive set leaves no wish unfulfilled and enchanted with the aromatic warm scent of the Lotus Blossom (Fior di Loto) and maintains with Acacia milk (crossbar d ' Acacia). Experience how to clean your skin with this set of Tesori d' Oriente products extensively and has a long-lasting scent of exotic and sensual myrrh. TESORI D ORIENTE Mirra / myrrh care set edt bathroom shower. Tesori d ´ Oriente HAMMAM set. TESORI d ' ORIENTE Hammam shower oil 250 ml. TESORI d ' ORIENTE Hammam hair and body oil 100 ml. TESORI d' ORIENTE Hammam SOAP 150 g. This Hammam set by Tesori d' Oriente let therefore no wishes open. Luxana Canastilla Set Unisex Giftset. GREY AMBERGRISS 0.3 ml. AGED COMBODI OUD 0.3 ml. OUD WOOD 0.3 ml. WHITE OUD 0.3 ml. BLACK OUD 0.3 ml. RARE HIMALAYAN DEER MUSK 0.3 ml. BULGARIAN PURE ROSE 0.3 ml. Acqua Di Parma BLU MEDITERRANEO ARANCIA DI CAPRI Gift Set 3 PC Unisex. Giardino dei Sensi argan eco organic gift set. Precious argan oil intensive soft wont even dry skin. Both products contain highly pure, certified organic oil. The scent is autumn warm. This beautiful gift set with body lotion and shower gel is ideal to give as a gift or Selberbehalten. The new Arab world is sophisticated and modern, yet rooted in its strong traditions. Ashyaa Dokhoon Gift Set by Anfasic Dokhoon, Embrace a daily ritual of scented beauty with this carefully selected choice of the SHAYest dokhoons. Thierry Mugler MUGLER COLOGNE Gift Set 3 PC Unisex. BASE NOTES: Patchouli, Precious Woods, White Musks, Amber Notes, Oakmoss, Vetiver, Leather, Animal Notes, Sandalwood, Amber Notes, Gurjum Balm. condition apply. of the dispatch. OLFACTIVE FAMILY: Oriental-Woody. Nenuco NENUCO MOCHILA ROSA Gift Set 4 PCSpray AGUA DE COLONIA 200ML JABÓN LÍQUIDO 200ML CHAMPÚ 200ML LECHE HIDRATANTE 200MLSpray Unisex. Acqua Di Parma BLU MEDITERRANEO MIRTO DI PANAREA Gift Set 3 PC Unisex. Base Notes : TREEMOSS, MUSK, OAKMOSS, TONKA BEANS, LABDANUM, CEDARWOOD, SANDALWOOD, SANDAL. Bulgari Petits Et Mamans 100ml EDT Unisex. Shams al Emarat Khususi Collection / Giftset by Ard al Zaafaran. This is an impressive and sensual and masculine fragrance whereas an amazing combination of citrus and oriental–woody notes that inspires! Acqua Di Parma BLU MEDITERRANEO CHINOTTO DI LIGURIA Gift Set 3 PC Unisex. Luxury Bathrobe Bathing Gift Set Style & Grace For Her. Acqua Di Parma colonia OUD Gift Set 3 PC Unisex.